In the last six stories written by Conan Doyle featuring Sherlock Holmes and Dr. Watson, the duo face some of their most challenging cases. 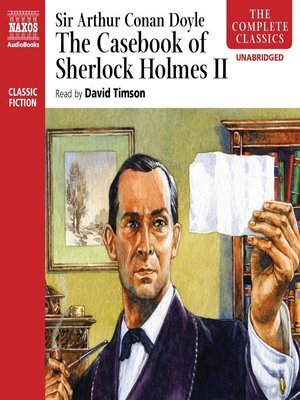 In The Adventure of the Illustrious Client, Holmes puts his own life in danger as he tries to cut short a young girl's infatuation with the notorious wife-murderer Baron Gruner. Why is Mrs. Maberley offered a handsome price for the Three Gables, provided she leaves at once and takes nothing with her? Even in his retirement, Holmes's skills are called upon, as he follows a trail of death on the Sussex coast in The Adventure of the Lion's Mane.